each per gift box.100 pcs per carton. 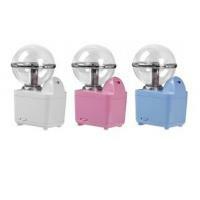 Gather three advantages "ball roller", "micro-vibration", "negative ions induction" in one. Based on several years of innovation and research, we have pioneered this integrated roller Ion Induction Anti-wrinkle eye massager. Thereby achieves 5 purposes " flow cream", "cooling", "vibration massage", "relief" and "induction" in one. Replenish sufficient essence into deep skin for relieving pouch, promote blood circulation, remove dark circles and wrinkles. 1) Roller ball function: To deposit a liquid gel to help massage and refresh puffy eyes on contact, reduce the appearance of dark circles and brighten eyes. 2) Micro-vibration: Introduces nutrition into basal skin during application which increases micro-circulation and helps reduce eye fatigue. 3) Negative ions function: Introduces essence into the deep skin, helps to tighten skin around eyes, reduces wrinkles and dark circles. 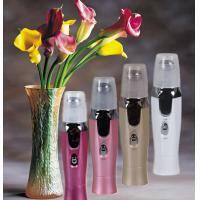 1) Roll-on Ion Induction Anti-wrinkle Eye Massageris a multi-functions eye beauty apparatus. It can be used not only as an instrument alone, but also with eye cream accompanied by the tail in the instrument. 2) Roller ball leads the eye cream which accompanied by the tail to the skin around eyes. 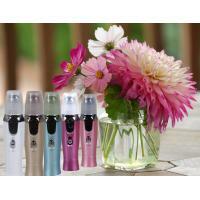 3) Micro-vibration enhances the absorption of eye essence. At the same time, micro-vibration can accelerate the micro-circulation, promote metabolism of skin. Thereby reduces the appearance of wrinkles, eliminate pouch under the eyes, edema, fade dark circles. 4) Negative ions induction can lead eye essence into the basal skin. Effectively relieves skin tension and eliminate eye fatigue. Also it has very good effects on removing the wrinkles around the nose, eyes and mouth. 1) Patent product with high technology and safety performance. 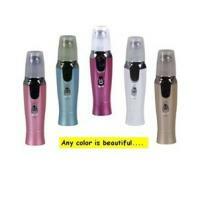 2) Compact and exquisite appearance, portable design, easy for using. 3) Eye cream could be replaced freely. 4) Batteries easy to replace, the product can be re-used long-term.